23 years after the fatwa on Salman Rushdie, and just under 7 years after the Danish cartoon scandal, history has repeated itself again. 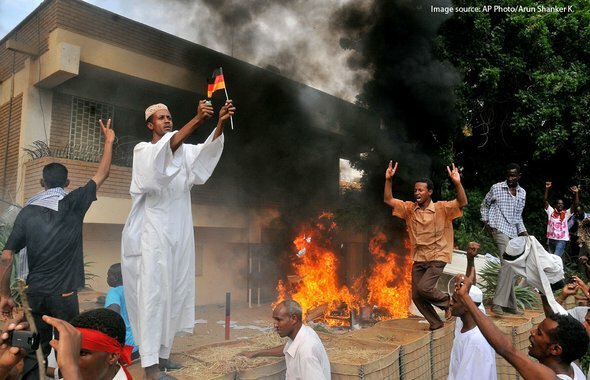 As of Sunday, 4 people have been killed, many more injured, and embassies around the world have been burned or vandalized, while protestors threaten to "behead those who insult Islam". All of this over a low-budget and extremely obscure video from an unknown director in California. Several thousand protesters pelted Japan's embassy in Beijing with eggs and plastic bottles, and crowds attacked a Japanese-owned department store in central China, as popular anger escalated over Tokyo's plans to purchase contested islands in the East China Sea. By serving as platforms for sharing weather information, market prices, and micro-insurance schemes, mobile phones are revolutionizing agriculture, as well as many other economic sectors across many countries in the African continent. An ex-Wall st. broker who once manipulated stock prices, gives his insight on wall street culture and secrets. The Carbon Monitoring for Action (CARMA) tool produced by the Center for Global Development has a database of 60,000 power plants worldwide with emissions data going back to 2004. Mega-dams and massive government-run irrigation projects are not the key to meeting world’s water needs, a growing number of experts now say. For developing nations, the answer may lie in small-scale measures such as inexpensive water pumps and other readily available equipment. New research shows troubling connection between obesity and dementia. Scientists interfered with the way the rats' brains respond to insulin, producing results that mimic dementia. The hormone is most famous for controlling blood sugar levels, but it also plays a key role in brain signalling. When scientists disrupted its path to the rats' neurons, the result was dementia. Living a healthy lifestyle into old age can add five years to women's lives and six years to men's, finds a study from Sweden published today. A system that allows autonomous vehicles to gain a 3D view of an area could reduce the chance of a collision (by sharing this GPS data in real-time with other cars) by 14 times. Four of China's 14 high-speed rail lines have been profitable eversince bullet trains started full-speed, intercity service in China two years ago, giving impetus to a Ministry of Railways expansion. Cardbord bicycle: $10 in materials. Waterproof. Light, and entirely recyclable.